Thank you Jim, much appreciated. 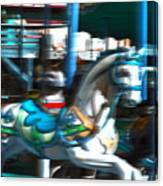 Digital photograph of a carousel horse in blue. 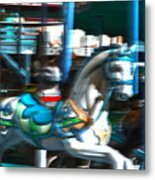 San Francisco Carousel Handcrafted in Italy, the San Francisco Carousel is intricately hand-painted with famous San Francisco landmarks including the Golden Gate Bridge, Coit Tower, Chinatown, Lombard Street, Alcatraz and the popular California sea lions at PIER 39, making it the only carousel in San Francisco (that we are aware of) that has artistic renderings of the city. 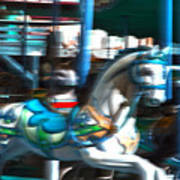 The carousel features 1,800 twinkling LED lights and 32 animals to ride, including sea dragons, sea lions, dolphins, panda bears and horses, as well as chariots and￿for the more adventurous riders￿spinning tubs. 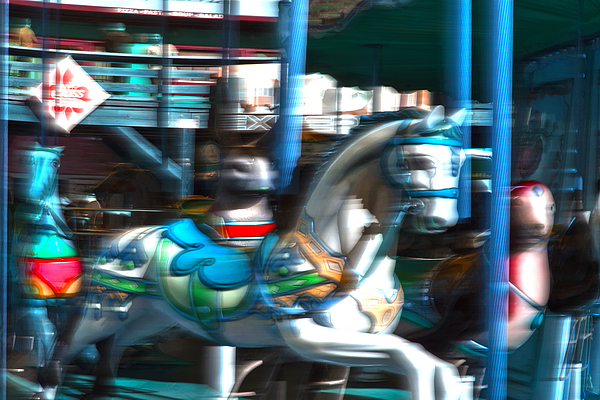 Throughout the ride, patrons hear traditional organ music and see PIER 39￿s bustling promenade.